Instructions: Cut a piece of white cardstock 12" x 6", score at 6" along the long side and score to create a base card 6" x 6". Cut a 6" x 6" panel of ombre paper from the Classic Petunia collection and adhere to the front of the card. 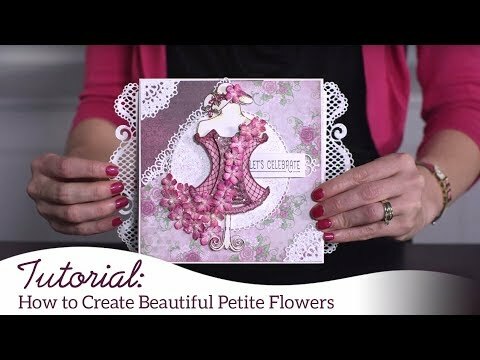 Cut a piece of white cardstock 6" x 4 1/2" and die cut the edges using the lace edge die from the HCD1-7212 Petite Pocket Accents Die set. Die cut 4 decorative pocket accent dies and adhere two together and adhere to the top and bottom of the previously cut outer die cut and adhere to the front of the card. Stamp the flower images from the HCPC-3608 Arianna Blooms Stamp set in Vibrant Fuchsia ink on Super White cardstock. Colour the centres with Buttercup ink and die cut with the coordinating die. 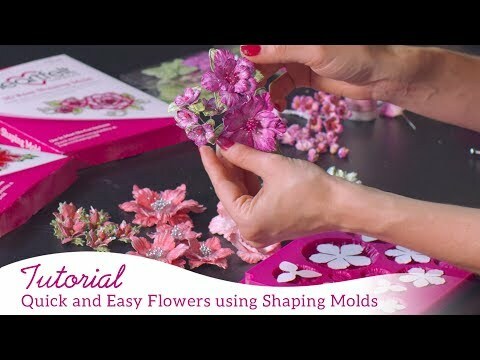 Colour the edges with Vibrant Fuchsia ink and shape using the 3D Basic Flower Shaping Mold. While still damp crease the edges of the flowers. When dry, assemble with two flowers of each size. Add Frosting Powder to the flowers with Dries Clear glue on a damp sponge. Add Heart of Gold Prills to the centres and add to the centre of the decorative dies as shown. Stamp the leaf images from the HCPC-3842 Oakberry Lane Stamp set with Library Green ink on Super White cardstock. Colour with Leaf Green, Fern Green and Vibrant Fuchsia inks and die cut with the coordinating die. Shape using the coordinating shaping mold and add Crystal Clear when dry with Dries Clear Glue with a damp sponge. Add around the flowers as shown. Stamp the petite flower images from the HCPC-3855 Floral Fashionista Stamp set in French Ultramarine ink on Super White cardstock. Colour the centres with Buttercup ink and the backs with French Ultramarine inks. Die cut with the coordinating die and shape using the coordinating mold. When dry, pierce the centres and thread the pale lemon bead stamens through and glue to keep in place. Add the Diamond Sprinkles using Dries Clear Glue on a damp sponge. Trim the wires and adhere the flowers as shown around the flowers and leaves. Die cut the tag image from the HCD1-7203 Ornamental Tags Die set from white cardstock. Stamp the sentiment from the HCPC-3845 Just for You Sentiments Stamp set in Vibrant Fuchsia ink on white cardstock. Die cut using the inner die from the tag. Adhere to the top of the card as shown.